Muslim accuser had personal conflict with him, attorney says. 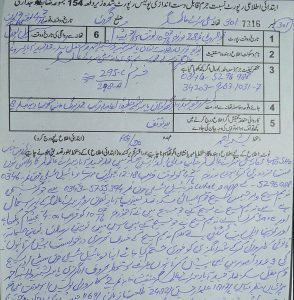 LAHORE, Pakistan (Morning Star News) – A Christian father of two in Pakistan has been sentenced to death for blaspheming Islam’s prophet in a phone text even though he is illiterate, sources said. Nadeem James, 27, was charged in July 2016 in Gujrat District after a friend, Yasir Bashir, complained to police that he received a poem via WhatsApp instant messaging that was derogatory towards Muhammad and other revered Islamic figures. James’ attorney, Riaz Anjum, told Morning Star News that the court sentenced James to death on Thursday (Sept. 14). “The trial was held inside the prison due to security reasons,” Anjum said, adding that they will challenge the conviction in the high court. “Bashir used to meet James almost every day, and we believe that it was then that he misused the latter’s phone for forwarding the blasphemous poem to himself,” Anjum said. He said that he had yet to receive the judgment, but that the conviction was based on data transferred from James’ phone. The lawyer said that James was deeply troubled by the conviction but hopeful that the high court will acquit him based on the facts. James’ brother, Shahbaz James, had earlier told Morning Star News that police had falsely charged his younger brother under pressure from local Islamist leaders, particularly Hafiz Muhammad Tariq, prayer leader of Yaqoobabad mosque in Sarai Alamgir, Gujrat District. Shahbaz said that James was uneducated and could not have possibly sent the text message. At that time a police official who requested anonymity told Morning Star News that officers registered the case against James under pressure from local Islamist leaders who had threatened to stage protests in the district if police delayed filing the First Information Report. 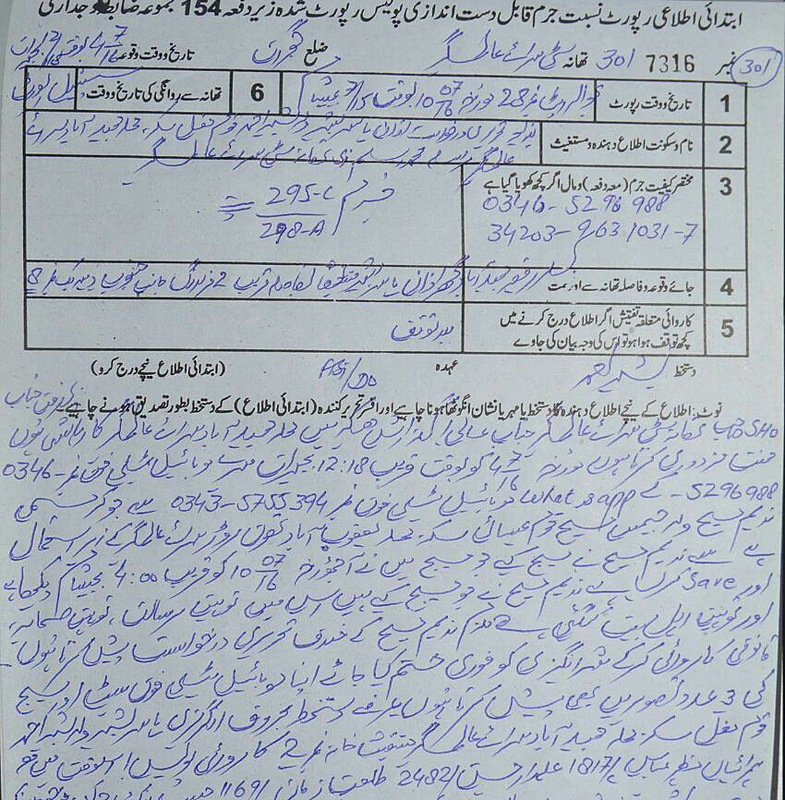 Police filed the case against James under Sections 295-C, defaming Muhammad, punishable by death and a fine, and 295-A, acts intended to outrage religious feelings, punishable by up to 10 years of prison and a fine, on the basis of the phone text provided by Bashir, a police spokesman then said. “According to our initial investigation, the WhatsApp text was sent to Yasir Bashir’s cell number on July 4, and the two sides had been negotiating a settlement until the talks broke down and Yasir Bashir informed us about the issue,” he said at that time. Relatives are caring for James’ two children because he and his wife are separated, according to his brother. Critics of Pakistan’s blasphemy statues, including European governments, assert they are misused, with hundreds languishing in jails under false charges that could see them face fines, life imprisonment or death by hanging. Pakistan has yet to execute anyone convicted of blasphemy, but anyone charged or accused of insulting Islam risks a violent death at the hands of vigilantes. A Christian laborer and his wife were thrown into the furnace of a brick kiln in 2014 after being wrongly accused of throwing pages of the Koran into the garbage. Christian mother of five Aasiya Noreen, commonly known as Asia Bibi, was convicted and sentenced to death by hanging in 2010 after an argument with a Muslim woman over a bowl of water. Although international attorneys note that lower courts did not consider which of three statements attributed to her were “blasphemous” nor prove the intent to blaspheme necessary for conviction, the courts upheld her conviction. She is awaiting a Supreme Court ruling on an appeal. 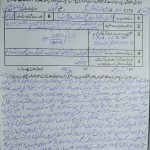 It is unjust and cruel for the accusation and death sentence of illiterate Nadeem James to be based on a handwritten blasphemy statement, which it was impractical for him to have written.